"Shin Lim Blows Minds With Unbelievable Card Magic - America's Got Talent 2018" YouTube. "'AGT' Champ Shin Lim Talks His 'Roller-Coaster Ride' Win" Click Here. 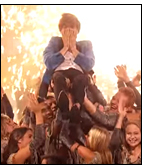 "Magician Shin Lim crowned winner of America’s Got Talent" Click Here. "Shin Lim: Magician Performs Jaw-Dropping, Unbelievable Card Magic - America's Got Talent 2018" Click Here. 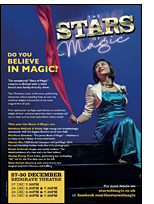 Stars of Magic, Redgrave Theatre, Bristol, 27th-30th December. Magic like you’ve never seen before! The sensational Stars of Magic returns to Bristol with a third, brand new, family-friendly show. This Christmas, seven of the most spellbinding illusionists will be travelling from all over the world to delight and astonish at the most magical time of year. From spectacular Las Vegas-style illusions to world-class sleight of hand. Previous years have been a complete sell out so make sure to book early before tickets vanish! Suitable for everyone who believes in magic, from age 5-105. Matthew McGurk & Katia: High energy and breathtakingly spectacular with the biggest illusions we’ve ever had! Matthew Dowden: The James Bond of Magic – Matthew is as classy as he is funny. A true entertainer. Horret Wu: FISM World Champion of Card Magic 2015. Horret’s stunning routine looks like trick photography. Bruce Airhead: Unique and totally bonkers. The metamorphosis of a man and a six foot balloon. Huang Zheng: From China, performing her enchanting “Air” act for the first time ever in the UK. Neal Austin: Returning with some brand new magical mayhem! Hilarious and baffling. Learn Hypnosis by Aaron Calvert in Manchester. Saturday 10th and Sunday 11th November. From the promoters: Learn Hypnosis 2 day course in Manchester. From the organisers: Aaron has fast carved out a niche in the world of hypnosis for doing things differently, moving away from the disrupt of embarrassing shows of old and achieving incredible results with hypnosis. Learn Aaron's style, technique and approach to take your performance to the next level in this hands-on, practical workshop. Taken from a combination of experience in entertainment and medical hypnotherapy Aaron's unique fusion of techniques has lead to the attention of industry chiefs, making him highly sort after in the theatre and TV scene. At the British Ring convention in Southport, Richard Cadell (and Sooty!) handed on the Presidential chain to Brian Lead, who intends to promote the Ring by touring local societies with his lecture 'A Deadly Way to Make a Living', based upon the fate of the 'Marvelous Chinese Conjuror' Chung Ling Soo. For details and availability email b.lead@btinternet.com. "A revealing lecture about an enigmatic figure." Richard Kaufman. 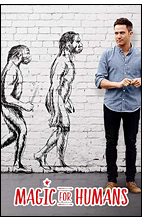 "A most compelling narrative." Ian Keable. "Although Brian’s tale of Chung Ling Soo reads like a page-turning thriller, it is all the more fascinating because it is based upon meticulously researched fact." Debbie McGee. Carl Royle lectures at The Surrey Society of Magicians on September 27th. Adam Mosley writes: Following on from his first lecture for us (How I Feed My Children) Carl brings a totally new different lecture "How I Feed My Children more - A lecture by Carl Royle". 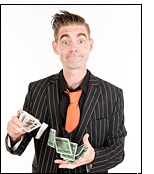 After making a living from performing magic for the last fifteen years Carl will share his approach to many of his highly commercial routines straight from his working repertoire. All delivered with the good humour you would expect from a working professional magician. In the lecture Carl will also discuss his approach to adding humour to your magic routines, making effects more magical for your audiences, and will include many stories from his time as a working professional magician. A proud member of the world famous Magic Circle in London, Carl Royle has also acted as president of one of the largest magical societies in the world, The Manchester Circle of Magicians. Carl has gained a sterling reputation on the corporate magic circuit for his amusing yet professional approach to corporate entertainment. Members are free and visiting magicians are welcome for a £10 entrance fee. The lecture takes place in East Horsley, Surrey, at 8pm. For full details please contact Adam Mosley info@surreymagic.org.uk. York Society of Magicians presents the Steve Short's Johnny Hart on Wednesday 10th October. Austin Siviter writes: From the moment Johnny Hart won the very first Magic Circle Young Magician of the Year Competition in 1961 his career took off on a rapid upward path which never slowed down. It was not long before Johnny Hart was in demand to appear on stage in variety shows and summer seasons, supporting some of the biggest names in show business. In between British engagements, Johnny carved a name for himself all over the world, including Las Vegas, where, for a one-year season he entertained at the Dunes, followed later by another extended period at the MGM Grand in Reno, Nevada.